The role of the Public Officer acts as the go-between between an incorporated association and the Department of Fair Trading. 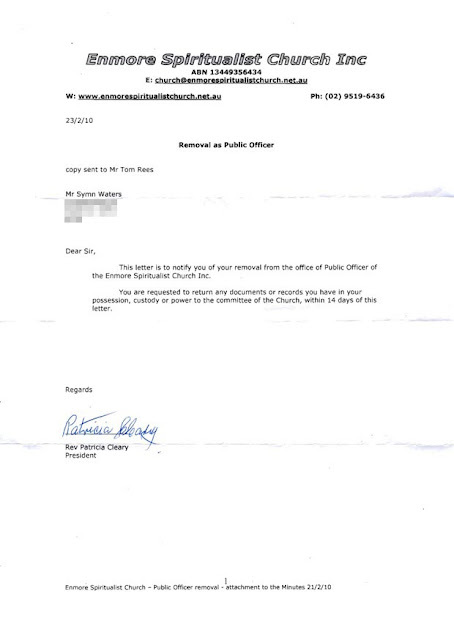 It seems that Patricia Cleary is desperate to remove the Public Officer and the Department of Fair Trading received a form from the church requesting that Jon Lindsay be the new officer holding the role. Jon Lindsay then fell out of favour and then the Department of Fair Trading received another form requesting that Kerrie Sevenoaks be the Public Officer. This, of course, cannot happen as the Public Officer cannot simply be removed at will and a general meeting has to be held. See below a letter the Public Officer received from Patricia Cleary. One has to ask why they are so desperate to remove people who ask questions surrounding the finances. Symn Waters remains as the Public Officer of Enmore Spiritualist Church.